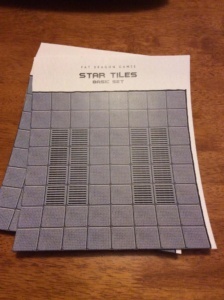 Many years ago I built a sci-fi board using Star Tiles map tiles from Fat Dragon Games. 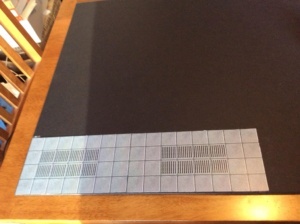 This is me laying out the tiles on a black foam core board. 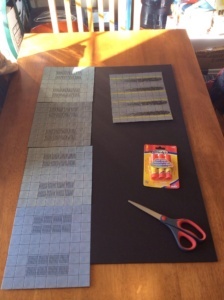 Pictured are Elmer’s glue sticks and scissors. 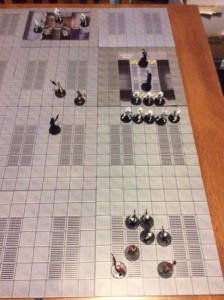 You can see I changed the layout to better fit tiles on the foam core board. Starting with the narrow tiles along the side. So after fussing with the glue stick it became evident that using two sided tape is easier and gives more control. Thew two sided tape takes some patience to keep it laying flat and then once you stick the tiles down you can stack books over the tiles to get them to stay put. 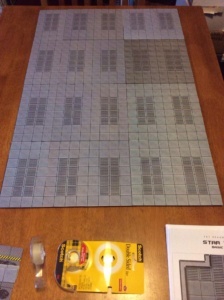 The two darker and lighter colored tiles were printed on different laser printers with different color engines. 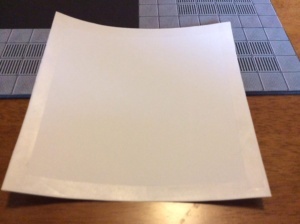 The Scotch two sided tape shown at the bottom. Just a few minis to show off the board. 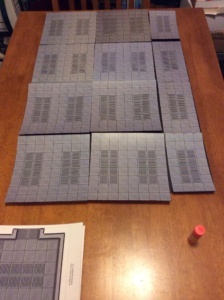 The two colored tiles are from Christopher West Maps of Mastery map sets.